Andrew, Christopher and Vasili Mitrokhin. 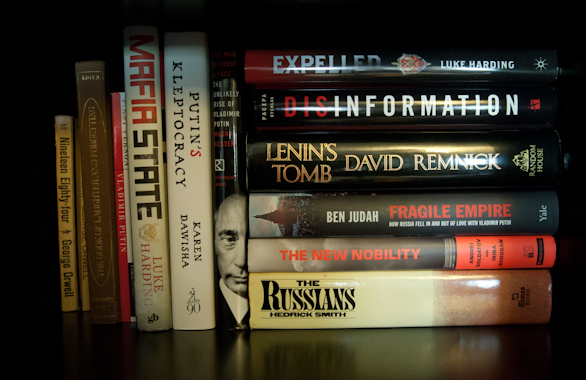 The Sword and The Shield: The Mitrokhin Archive and the Secret History of the KGB. New York: Basic Books, 1999. UR. History, Russia, KGB. Andrew, Christopher and Vasili Mitrokhin. The World Was Going Our Way: The KGB and the Battle for the Third World. New York: Basic Books 2005. UR. History, Russia, KGB. Putin, Vladimir. First Person: An Astonishingly Frank Self-Portrait by Russia’s President. With Nataliya Gevorkyan, Natalya Timakova, and Andrei Kolesnikov. Catherine A. Fitzpatrick, Translator. New York: Public Affairs, 2000. Berlinksi, Claire. “The Cold War’s Arab Spring: How the Soviets Created Today’s Middle East.” Tablet Magazine, June 20, 2012. Cold War International History Project, Wilson Center. Dawisha, Karen. Putin’s Russia. Website. 2014. Gneiting, Kelly. “Russian Red Jihad (It’s Not Islam-ism, it’s Communism).” Independent American Party, October 10, 2012. Goble, Paul. “Putin’s New Totalitarianism Relies on ‘Targeted Repression and Mass Manipulation,’ Gudkov Says.” Stop Fake, August 22, 2016. Makienko, James. “Russian hybrid warfare: what are effects-based network operations and how to counteract them.” Geopoli.info, November 10, 2014. Mitrokhin Archive. Digital Archive. Wilson Center. Pacepa, Ion Mihai. “Russian Footprints: What does Moscow have to do with the recent war in Lebanon?” National Review Online. August 24, 2006. Weingarten, Benjamin. “5 allegations that may have gotten a Russian spy-turned-whistleblower killed by a mini nuclear weapon.” The Blaze, January 28, 2015. This article covers Alexander Litvinenko‘s allegations concerning Moscow and terrorism. Related online and from 2005: http://www.thenewamerican.com/world-news/europe/item/15162-defector-putin-s-kgb-trained-top-al-qaeda-terrorists — the web serves better for ideas than for trials, but there’s a lode of similar KGB-AQ articles online.